Three types of financial measures are useful in assessing the actuarial status of the Social Security trust funds under the financing approach specified in current law: (1) annual cash-flow measures, including income and cost rates, and balances; (2) trust fund ratios; and (3) summary measures like actuarial balances and unfunded obligations. The first long-range estimates presented are the series of projected annual balances (or net cash flow), which are the differences between the projected annual income rates and annual cost rates (expressed as percentages of the taxable payroll). In assessing the financial condition of the program, particular attention should be paid to the level of the annual balances at the end of the long-range period and the time at which the annual balances may change from positive to negative values. The next measure discussed is the pattern of projected trust fund ratios. The trust fund ratio represents the proportion of a year’s projected cost that could be paid with the funds available at the beginning of the year. Particular atten­tion should be paid to the level and year of maximum trust fund ratio, to the year of exhaustion of the funds, and to the stability of the trust fund ratio in cases where the ratio remains positive at the end of the long-range period. When a program has positive trust fund ratios throughout the 75-year projec­tion period and these ratios are stable or rising at the end of the period, the program financing is said to achieve sustainable solvency. The final measures discussed in this section summarize the total income and cost over valuation periods that extend through 75 years, and to the infinite horizon. These measures indicate whether projected income will be adequate for the period as a whole. The first such measure, actuarial balance, indicates the size of any surplus or shortfall as a percentage of the taxable payroll over the period. The second, open group unfunded obligation, indicates the size of any shortfall in present-value dollars. This section also includes a compari­son of covered workers to beneficiaries, a generational decomposition of the infinite future unfunded obligation, the test of long-range close actuarial bal­ance, and the reasons for change in the actuarial balance from the last report. If the 75-year actuarial balance is zero (or positive), then the trust fund ratio at the end of the period will be at 100 percent (or greater), and financing for the program is considered to be adequate for the 75-year period as a whole. (Financial adequacy, or solvency, for each year is determined by whether the trust fund asset level is positive throughout the year.) Whether or not finan­cial adequacy is stable in the sense that it is likely to continue for subsequent 75-year periods in succeeding reports is also important when considering the actuarial status of the program. One indication of this stability, or sustainable solvency, is the behavior of the trust fund ratio at the end of the projection period. If trust fund ratios for the last several years of the long-range period are positive and constant or rising, then it is likely that subsequent Trustees Reports will also show projections of financial adequacy (assuming no changes in demographic and economic assumptions, or the law). The actuar­ial balance and the open group unfunded obligation for the infinite future provide additional measures of the financial status of the program for the very long range. Basic to the consideration of the long-range actuarial status of the trust funds are the concepts of income rate and cost rate, each of which is expressed as a percentage of taxable payroll. Other measures of the cash flow of the pro­gram are shown in Appendix F. The annual income rate is the sum of the tax contribution rate and the ratio of income from taxation of benefits to the OASDI taxable payroll for the year. The OASDI taxable payroll consists of the total earnings which are subject to OASDI taxes, with some relatively small adjustments.1 As such, it excludes net investment income and reim­bursements from the General Fund of the Treasury for the costs associated with special monthly payments to certain uninsured persons who attained age 72 before 1968 and who have fewer than 3 quarters of coverage. The projections for OASI under the intermediate assumptions show the income rate rising due to the gradually increasing effect of the taxation of benefits. The pattern of the cost rate is much different. From about 2010 to 2030, the cost rate increases rapidly as the baby-boom generation reaches retirement eligibility age. After 2030, the cost rate remains fairly stable for about 40 years and thereafter rises slowly reflecting projected reductions in death rates and continued relatively low birth rates. The cost rate reaches 15.20 percent of taxable payroll for 2082. By comparison, the income rate reaches 11.43 percent of taxable payroll for 2082. Projected income rates under the low cost and high cost sets of assumptions are very similar to those projected for the intermediate assumptions as they are largely a reflection of the tax rates specified in the law. OASI cost rates for the low cost and high cost assumptions differ significantly from those projected for the intermediate assumptions. For the low cost assumptions, the cost rate decreases through 2009, then rises, until it peaks in 2034 at a level of 13.10 percent of payroll. The cost rate then declines gradually, reaching a level of 11.06 percent of payroll for 2082 (at which point the income rate reaches 11.20 percent). For the high cost assumptions, the cost rate rises throughout the 75-year period. It rises at a relatively fast pace between 2010 and 2030 because of the aging of the baby-boom generation. Subsequently, the projected cost rate continues rising and reaches 21.62 percent of payroll for 2082 (at which point the income rate reaches 11.79 percent). The pattern of the projected OASI annual balance is important in the analysis of the financial condition of the program. Under the intermediate assump­tions, the annual balance is positive for 10 years (through 2017) and is nega­tive thereafter. This annual deficit rises rapidly, reaching 2 percent of taxable payroll by 2025, and continues rising generally thereafter, to a level of 3.76 percent of taxable payroll for 2082. Under the low cost assumptions, the projected OASI annual balance is posi­tive for 13 years (through 2020) and then becomes negative, with the annual deficit peaking at 1.82 percent of taxable payroll for 2034. Thereafter, the annual deficit declines. By 2072, the OASI annual balance becomes positive, reaching a surplus of 0.15 percent of payroll in 2082. Under the high cost assumptions, however, the OASI balance is projected to be positive for only 7 years (through 2014) and to be negative thereafter, with a deficit of 1.87 percent for 2020, 5.79 percent for 2050, and 9.84 percent of payroll for 2082. Historical income rates are modified to include adjustments to the lump-sum payments received in 1983 from the General Fund of the Treasury for the cost of noncontributory wage credits for military service in 1940-56. Under the intermediate assumptions, the cost rate for DI generally increases over the long-range period from 1.94 percent of taxable payroll for 2008, reaching 2.30 percent for 2082. The income rate increases only very slightly from 1.83 percent of taxable payroll for 2008 to 1.86 percent for 2082. The annual deficit is about 0.11 percent in 2008 and reaches 0.44 percent for 2082. Under the low cost assumptions, the DI cost rate is fairly stable over the long-range period, reaching 1.56 percent for 2082. The annual balance is negative for the first 3 years and is positive throughout the remainder of the long-range period. For the high cost assumptions, DI cost rises much more, reaching 3.18 percent for 2082. The annual deficit is about 0.19 percent in 2008 and reaches 1.30 percent for 2082. Figure IV.B1 shows in graphical form the patterns of the OASI and DI annual income rates and cost rates. The income rates shown here are only for alternative II in order to simplify the graphical presentation because, as shown in table IV.B1, the variation in the income rates by alternative is very small. Income rates increase generally, but at a slow rate for each of the alter­natives over the long-range period. Both increases in the income rate and variation among the alternatives result from the relatively small component of income from taxation of benefits. Increases in income from taxation of benefits reflect increases in the total amount of benefits paid and the fact that an increasing share of individual benefits will be subject to taxation because benefit taxation threshold amounts are not indexed. The patterns of the annual balances for OASI and DI are suggested by figure IV.B1. For each alternative, the magnitude of each of the positive balances, as a percentage of taxable payroll, is represented by the distance between the appropriate cost-rate curve and the income-rate curve above it. The magni­tude of each of the deficits is represented by the distance between the appro­priate cost-rate curve and the income-rate curve below it. In the future, the cost of OASI, DI and the combined OASDI programs as a percentage of taxable payroll will not necessarily be within the range encom­passed by alternatives I and III. Nonetheless, because alternatives I and III define a reasonably wide range of demographic and economic conditions, the resulting estimates delineate a reasonable range for consideration of potential future program costs. The cost of the OASDI program has been discussed in this section in relation to taxable payroll, which is a program-related concept that is very useful in analyzing the financial status of the OASDI program. The cost can also be discussed in relation to broader economic concepts, such as the gross domes­tic product (GDP), which is the total value of goods and services produced during the year in the United States. OASDI cost generally rises from about 4.3 percent of GDP currently to about 5.8 percent of GDP by the end of the 75-year projection period under alternative II. Discussion of both the cost and the taxable payroll of the OASDI program in relation to GDP is pre­sented in Appendix VI.F.2 beginning on page 177. The primary reason that the estimated OASDI cost rate increases rapidly between 2010 and 2030 is that the number of beneficiaries is projected to increase more rapidly than the number of covered workers. This occurs because the relatively large number of persons born during the baby boom will reach retirement eligibility age, and begin to receive benefits, while the relatively small number of persons born during the subsequent period of low fertility rates will comprise the labor force. A comparison of the numbers of covered workers and beneficiaries is shown in table IV.B2. The impact of the demographic shifts under the three alternatives on the OASDI cost rates is readily seen by considering the projected number of OASDI beneficiaries per 100 covered workers. As compared to the 2007 level of 30 beneficiaries per 100 covered workers, this ratio is estimated to rise significantly by 2085 to 38 under the low cost assumptions, 51 under the intermediate assumptions, and 68 under the high cost assumptions. The sig­nificance of these numbers can be seen by comparing figure IV.B1 to figure IV.B2. For each alternative, the shape of the curve in figure IV.B2, which shows beneficiaries per 100 covered workers, is strikingly similar to that of the cor­responding cost-rate curve in figure IV.B1, thereby emphasizing the extent to which the cost of the OASDI program as a percentage of taxable payroll is determined by the age distribution of the population. Because the cost rate is basically the product of the number of beneficiaries and their average bene­fit, divided by the product of the number of covered workers and their aver­age taxable earnings (and because average benefits rise at about the same rate as average earnings), it is to be expected that the pattern of the annual cost rates is similar to that of the annual ratios of beneficiaries to workers. Table IV.B2 also shows that the number of covered workers per OASDI ben­eficiary, which was about 3.3 in 2007, is estimated to decline in the future. Based on the intermediate assumptions, the ratio declines to 2.1 by 2034, and thereafter declines very slowly reaching 2.0 workers per beneficiary by 2071. The slow decline after 2034 is due to the assumed gradual decline in death rates. 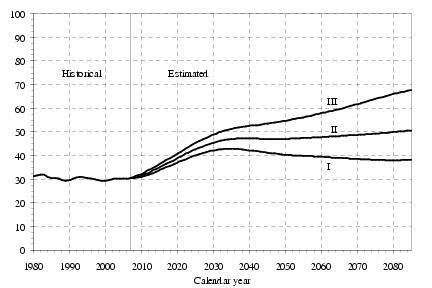 Based on the low cost assumptions, for which high fertility rates and small reductions in death rates are assumed, the ratio declines to 2.3 by 2032, and then rises back to a level of 2.6 by 2063. Based on the high cost assumptions, for which low fertility rates and large reductions in death rates are assumed, the decline is much greater, reaching 1.8 by 2048, and 1.5 workers per beneficiary by 2077. Trust fund ratios are useful indicators of the adequacy of the financial resources of the Social Security program at any point in time. For any year in which the projected trust fund ratio is positive (i.e., the trust fund holds assets at the beginning of the year), but is not positive for the following year the trust fund is projected to become exhausted during the year. Under present law, the OASI and DI Trust Funds do not have the authority to bor­row. Therefore, exhaustion of the assets in either fund during a year would mean there are no longer sufficient assets in the fund to cover the full amount of benefits scheduled for the year under present law. The trust fund ratio also serves an additional important purpose in assessing the actuarial status of the program. When the financing is adequate for the timely payment of full benefits throughout the long-range period, the stabil­ity of the trust fund ratio toward the end of the period indicates the likelihood that this projected adequacy will continue for subsequent Trustees Reports. If the trust fund ratio toward the end of the period is level (or increasing), then projected adequacy for the long-range period is likely to continue for subse­quent reports. Under these conditions, the program financing is said to achieve sustainable solvency. Table IV.B3 shows, by alternative, the estimated trust fund ratios (without regard to advance tax transfers that would be effected after the end of the 10‑year, short-range period) for the separate and combined OASI and DI Trust Funds. Also shown in this table is the year in which a fund is estimated to become exhausted, reflecting the effect of the provision for advance tax transfers. Based on the intermediate assumptions, the OASI trust fund ratio rises steadily from 392 percent at the beginning of 2008, reaching a peak of 445 percent at the beginning of 2014. This increase in the OASI trust fund ratio results from the fact that the annual income rate exceeds the annual cost rate for several years (see table IV.B1). Thereafter, the OASI trust fund ratio declines steadily, with the OASI Trust Fund becoming exhausted in 2042. The DI trust fund ratio follows a pattern that is similar but unfolds more rap­idly. The DI trust fund ratio is estimated to decline steadily from 199 percent at the beginning of 2008 until becoming exhausted in 2025. The trust fund ratio for the combined OASI and DI Trust Funds under the intermediate assumptions rises from 359 percent for 2008 to a peak of 395 percent at the beginning of 2014. Thereafter, the ratio declines, with the combined funds becoming exhausted in 2041. In last year’s report, the peak trust fund ratio for the combined funds was estimated to be 409 percent for 2014 and the year of exhaustion was estimated to be 2041. The trust fund ratio for the OASDI program under the intermediate assump­tions first declines in 2015. This occurs because the increase in trust fund assets during 2014, which reflects interest income and a small excess of non­interest income over cost, occurs at a slower rate than does the increase in the annual cost of the program between 2014 and 2015. After 2014, the dollar amount of assets is projected to continue to rise through the beginning of 2027 because interest income more than offsets the shortfall in noninterest income. Beginning in 2017, the OASDI program under the intermediate assumptions is projected to experience increasingly large cash-flow shortfalls that will require the trust funds to redeem special public-debt obligations of the Gen­eral Fund of the Treasury. This will differ from the experience of recent years when the trust funds have been net lenders to the General Fund of the Treasury. The change in the cash flow between the trust funds and the gen­eral fund is expected to have important public policy and economic implica­tions that go well beyond the operation of the OASDI program itself. Based on the low cost assumptions, the trust fund ratio for the DI program increases from 2011 through the end of the long-range projection period, reaching the extremely high level of 2,111 percent for 2083. At the end of the long-range period, the DI trust fund ratio is rising by 38 percentage points per year. For the OASI program, the trust fund ratio rises to a peak of 500 percent for 2018, drops to a low of 323 percent for 2054, and rises there­after to a level of 424 percent for 2083. At the end of the period, the OASI trust fund ratio is rising by 5 percentage points per year. For the OASDI pro­gram, the trust fund ratio peaks at 464 percent for 2020, falls to 387 percent for 2043, and increases thereafter, reaching 633 percent for 2083. Because the trust fund ratios are large and increasing at the end of the long range period, subsequent Trustees Reports are likely to contain projections of ade­quate long-range financing of the OASI, the DI, and the combined OASI and DI programs under the low cost assumptions. Thus, under the low cost assumptions, each program would achieve sustainable solvency. In contrast, under the high cost assumptions, the OASI trust fund ratio is esti­mated to peak at 413 percent for 2011, thereafter declining to fund exhaus­tion by the end of 2033. The DI trust fund ratio is estimated to decline from 196 percent for 2008 to fund exhaustion by the end of 2017. The combined OASDI trust fund ratio is estimated to rise to a peak of 365 percent for 2011, declining thereafter to fund exhaustion by the end of 2031. 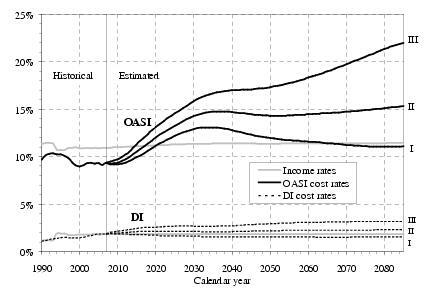 Even under the high cost assumptions, however, the combined OASI and DI funds on hand plus their estimated future income would be able to cover their combined cost for 23 years into the future (until 2031). Under the intermedi­ate assumptions the combined starting funds plus estimated future income would be able to cover cost for about 33 years into the future (until 2041). The program would be able to cover cost for the foreseeable future under the more optimistic low cost assumptions. In the 2007 report, the combined trust funds were projected to become exhausted in 2030 under the high cost assumptions and in 2041 under the intermediate assumptions.